Think using hands-free technology to text, tweet or respond to e-mails while driving is safer than talking on a cell phone? You're wrong, AAA says. An in-depth scientific study from AAA finds that using voice-to-text electronic devices is a far greater distraction for drivers than talking on cell phones, even if they are hands free. 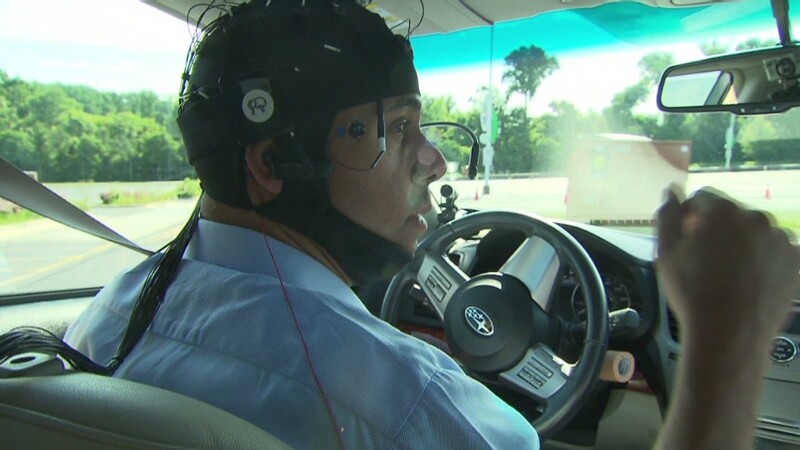 The study measured brain waves and reaction times of drivers, both in driving simulators and on real roads, in order the measure the comparable levels of distraction. The study found that talking to another passenger in the car or using a cell phone, whether using a hands-free device or holding the phone in your hand, all were a comparable level of distraction for the driver -- a rating of 2.3 to 2.5 on a five-point scale. But using some kind of voice-to-text devise, such as a smart phone, a GPS system or systems that allow drivers to make dinner reservations or buy movie tickets, had a distraction level of 3.1, which the study said was a materially greater distraction for drivers, even though those systems are "hands free." For example the delay in the reaction time went from 15% in the case of cell phone use to 25% when using speech-to-talk devices. "This underscores that just because a car or a phone allows you to do something hands free while driving doesn't mean it's safe to do," said Justin McNaull, director of state relations for AAA. Listening to the radio or an audio book provides only a minimal distraction of between 1.3 and 1.7. Real-world use of voice-to-text devices could be even more distracting than what AAA measured. McNaull said the study actually measured a best-case-scenario use of voice-to-text devices, where the voice recognition is perfect enough to not require the driver to proof-read and possibly correct the text. He said the real world offerings don't work that well and thus would be an even greater distraction. The study did not compare the use of manual texting or typing into the devices. But McNaull said the use of voice-to-text can be a greater threat than manual entry if it makes texting seem safer or easier to do while driving. "They do some good by getting hands on the steering wheel and eyes off the devices," he said. "When you're allowing them to do it with voice, you're encouraging them to do it by making it convenient." Related: Text messaging falls for the first time in the U.S. There are 41 states which ban texting while driving. But McNaull said none of those states ban texting when the driver uses voice-to-text to send the message. He said only one place in the country -- Chapel Hill, N.C. -- bans all mobile communications by drivers, and that law may be overturned soon. The travel group stopped short of calling for laws to ban all voice-to-text technology, but said it wants to make drivers aware of the findings so they can make their own decision not to use them while driving. "We're pragmatic. We realize technology and product development operate in a world balancing consumer preferences and acceptable risks," he said. "We're not saying we want them banned. But we'd like industry to slow down." But automakers and the electronics industry are working hard to provide drivers with more connectivity, often through the use of voice-to-text technology. In February General Motors (GM) and AT&T (T) announced a partnership that will essentially turn GM cars into mobile Wi Fi hot spots. GM estimated at that time that 50% of its cars will have wireless capabilities by 2015. The automakers would not comment for this story, deferring to the Alliance of Automobile Manufacturers. "We'll need to review the AAA/University of Utah study, but we're extremely concerned that it could send a misleading message since it suggests that hand-held and hands-free devices are equally risky," said Alliance spokesman Wade Newton. "There are many other academic studies under way, and road safety will be enhanced by letting the complete body of research drive policy recommendations," he said.